Exploring Thailand’s Samut Prakan Province was the topic of the guest speaker’s talk at the November 13 meeting of the Pattaya City Expats Club. Member John Lynham presented a slide show while describing the tour of the province that was recently taken by PCEC members and their guests. All the slides were taken by John and other tour participants. 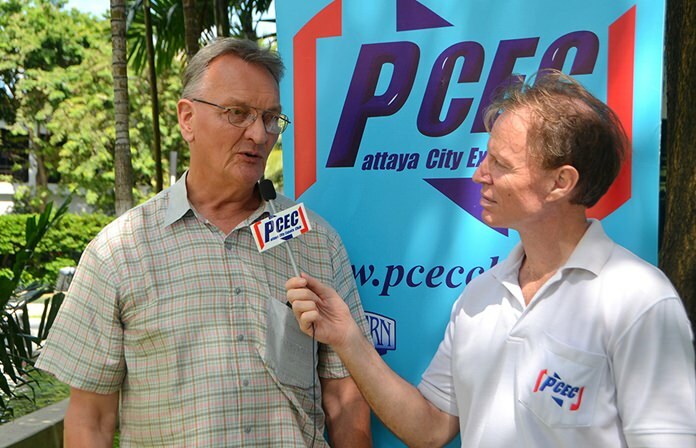 Member John Lynham shares with his PCEC audience the many sights and places he and several other members and guests recently made to Samut Prakan Province. 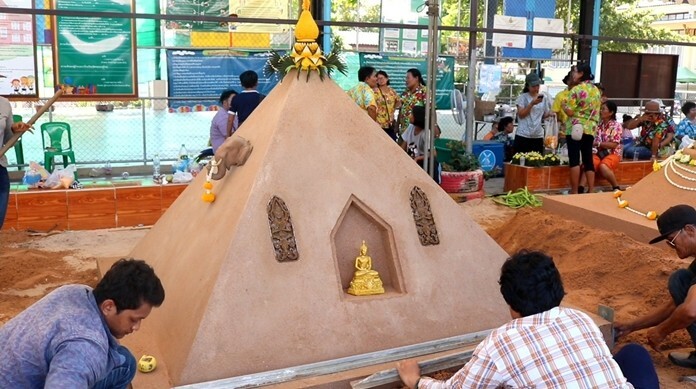 The main focus of the tour was the Lotus Throwing Festival, which is held every year in Samut Prakan’s Bang Phli district and coincides with Awk Phansa (literally: “Out of the Rains”), a Thai holiday marking the time when monastics are free to travel again after spending the monsoon months in study and meditation. 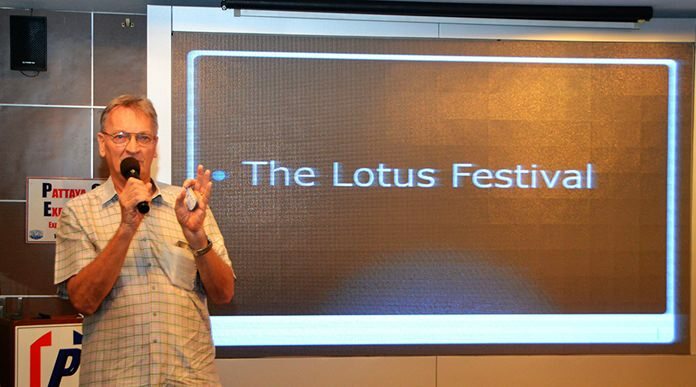 John showed numerous colorful slides of the main event – an elaborate floating procession down a local klong, featuring intricately decorated wooden boats rowed by local people. Usually, the rowers are dressed in traditional Thai costumes, but John explained that this year, in respect for the recent passing of Thailand’s revered King, they were all dressed in black or white. 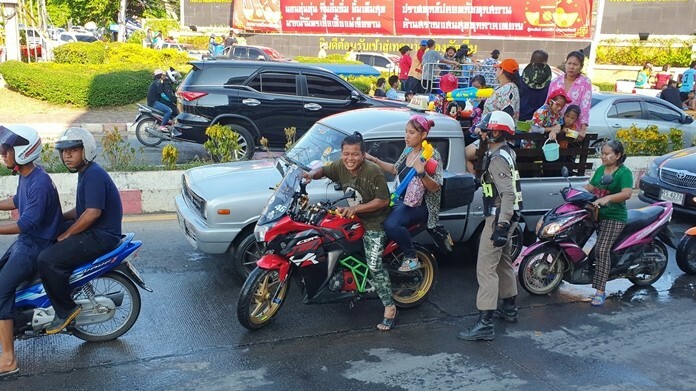 Tour participants joined the thick crowds of Thai people throwing lotuses at the boats, especially the one carrying Luang Phor Toh, a sacred Buddha image that’s said to have miraculously floated down the Chao Phraya River centuries ago. After the boats passed by, the group visited Wat Bang Phli Yai, where Luang Phor Toh is housed. John explained that the temple also houses an immense reclining Buddha image known as Somdet Phra Sakayamuni Si Sumet Bophit, which is approximately 53 meters long – longer than Bangkok’s famous Reclining Buddha! The group took many photos inside the Buddha shrine, which has four stories. The first floor houses meditation cells; the second floor has images of the 500 Arahats and murals depicting Hell and Heaven; the third floor has paintings of several other sacred Buddha images; the fourth floor houses a Lord Buddha’s relic taken from Colombo, Sri Lanka, in 1987, and also the Reclining Buddha’s heart. John said he was especially intrigued by a photo of a drawing depicting horse racing; but he said he later learned that the text above the drawing was not promoting horse racing, but rather telling people not to waste their money on betting and to donate it to the temple instead. Next on the itinerary was the seaside Sailom Bangpuu Restaurant, rated as the number one Thai restaurant in Samut Prakan. In addition to great food, the restaurant features a unique ceiling of ceramic plates! The reason for the plates became clear when the group enjoyed a variety of delicious desserts at the adjacent Ceramic Cafe, where the owner herself is a ceramic artist. Member Ren Lexander interviews John Lynham after his presentation to the PCEC. The video can be viewed at: https://www.youtube.com/watch?v=P8TgBM8wrFk&t=15s. After lunch, the group visited the Thamma Katanyu Temple, built 25 years ago by a group of Taiwanese Taoists. The design of the shrine is adapted from the Chinese art style Nan Kun Sern Tai Thian Fu Foundation in Taiwan. Here again, John showed beautiful slides of the intricate architecture and images, from the auspicious animal statues decorating the roof, to the elegant Chinese imported jade-carved wall featuring Buddhist tales. One of the many colorful boats shown by John Lynham on his presentation of Samut Prakan’s Lotus Throwing Festival visited during the tour by PCEC members and guests. The next stop was the Phra Chulachomklao Fort & Museum, built by King Rama V (King Chulalongkorn, 1868-1910) in an effort to prevent European nations from colonizing Thailand. The fort features seven “Disappearing” cannons that were once state-of-the-art products. John related the role that the fort played in the three-hour 1893 Franco-Siamese War. The final stop was the Erawan Museum, built by late business tycoon Lek Viriyapant, who also conceived the Sanctuary of Truth in Pattaya, and Bangkok’s popular Ancient City. The colossal three-headed elephant statue (250 tons in weight, 20 meters high and 39 meters long) standing on a pink pedestal has become one of the most revered objects in Samut Prakan Province. 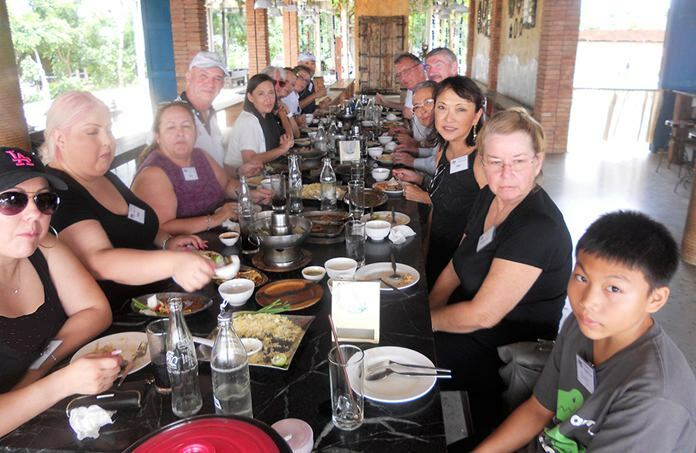 PCEC members and guests enjoy lunch at the Sailom Bangpuu Restaurant in Samut Prakan with the unique addition of ceramic plates decorating the ceiling. Underneath the gigantic bronze statue is a 3-level museum housing numerous priceless antiques and religious objects. Each level symbolizes a part of the Thai cosmos. At the top, in the belly of the beast, is Tavatimsa Heaven. This in Buddhist cosmology is said to be where sacred beings, including elephant deity Airavata (Erawan), congregate. The room has been described as a place where “the solemn serenity of the room’s Buddha images – a walking Buddha and eight more in a variety of postures – is oddly offset by lurid abstract art that lines the concave walls, and depicts the solar system. True to the fusing of ideas, art-forms and religions which runs throughout, here the solemn serenity of a temple meets the surrealism of a Dali painting, albeit a three-dimensional one.” An intriguing end to a colorful, enjoyable day exploring some of the lesser-known treasures of this beautiful country. After the presentation, MC Ren Lexander brought everyone up to date on upcoming events and was followed by the Open Forum, where questions are asked and answered about Expat living in Thailand, especially Pattaya. For more information on the PCEC’s many activities, visit the club’s website at www.pcecclub.org.